Great news! The organic industry is fighting to strengthen its animal welfare standards to ensure the health and well-being of livestock and poultry throughout their lives. As written, the U.S. Department of Agriculture’s proposed rule would strengthen the existing animal welfare regulations for organic poultry, cattle and pigs by adding new requirements for an animal’s living conditions, transportation and slaughter. 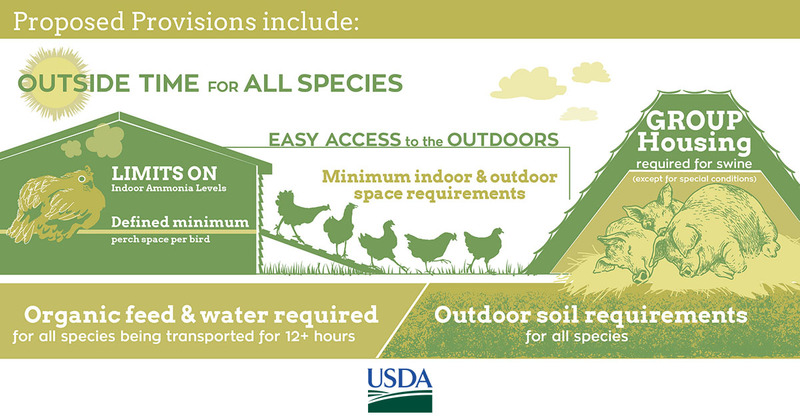 It would also establish minimum indoor and outdoor space requirements for organic poultry. But these important rules are at risk and could all be undone if some members of Congress get their way. You read that right. The Senate could vote on an amendment to a USDA spending bill as early as this week that would block the new regulations, proposed in April by the USDA’s National Organic Program. Unlike other voluntary animal welfare labels that may be created and overseen by organizations, farm associations or food companies such as McDonald’s and KFC, organic animal welfare rules are backed by federal regulations and verified by third-party inspection. The amendment in question would block the USDA’s animal welfare rule from going into effect beginning Oct. 1. The rule is open for public comment until July 13. Many in the organic and animal welfare communities strongly support the rule and oppose Congressional efforts to sidetrack it. A recent Consumer Reports survey found that nearly 70 percent of Americans believe that the living space of organic animals should meet some meaningful minimum size requirements and that organic animals should have access to the outdoors. Elanor Starmer, administrator of the USDA Agricultural Marketing Service, calls the animal welfare rule an important step that will strengthen consumer confidence in the organic label.